Carnivorous perennial that forms funnel-shaped insect traps by adaptation of the leaf. Rather variable in form and size. 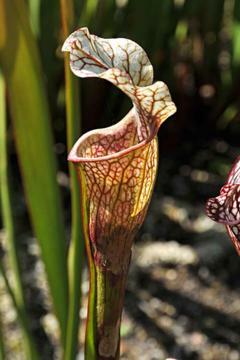 The erect pitchers are normally yellowish green and white at the tops, heavily veined with red. Produces 2 sets of traps each season, the later ones are larger and last into autumn. Large red flowers in spring.